Members of Lifestyle Holidays Vacation Resort enjoy a V.I.P status on property that gives them a WORLD of V.I.P privileges, guaranteeing that their vacations are an unforgettable experience! With your Lifestyle Membership, along with exclusive restaurants, come a host of additional privileges created for Members Only! Luxury All-IN: This special concept is designed to show that all you could want in your membership vacation is included: Fine Cuisine, Exclusive Facilities and Amenities, Attentive Service and more. Exclusive Beaches with lavish beach beds, hammocks, cool water jet tubs, international bar with top shelf options and specialty snack areas. Exclusive Pool – The V.I.P pool is set in a sumptuous environment conducive for lazing in a place that is both relaxed, and upscale; while being pampered with pool side drink and snack service. Lifestyle Tower The Lifestyle Tower is an impressive four-story building dedicated to the Lifestyle Holidays Vacation Club and exclusive for Members, features V.I.P and Member Services offices, two floors for LHVC presentations, AZUL (a V.I.P Member restaurant) and Anja’s Lounge. The roof of this high-tech, modern structure is a landing pad for the LHVC helicopter, which transports V.I.P members. There is nothing so classic as an original, and V.I.P Beach is the model that all others have been based.Boasting large luxurious one and two-tier beds with privacy curtains, the V.I.P Beach is a must for total indulgence. Bedside service awaits you so don’t get up, just tell us what you want and it will be taken care of! Famous for their highly requested and recommended “Baileys Colada”, the staff will whip up any arrangement of international beverage that you can imagine. You have a choice of four whirlpools to lounge your afternoon away in, once again, it is not necessary to move, unless you need to cool down in the waterfalls. A top rated Sushi-Sashimi bar is just a few steps up, but still, ask your gracious waitress to bring some delicious choices down to you, it will be her pleasure. V.I.P SPORTS BAR:Serving up specialty drinks, snacks and the latest in sports news from a multitude of TVs that can be seen from anywhere in the room, this nod to all popular sports is a great place for V.I.P Members to come, kick back and cheer for your favorite team. THE SPOT:The Spot is a cutting edge environment located on the balcony level of V.I.P pool with the popular Hookah bar concept. This is a place where Members can kick back and try something new and a little bit daring. This event is a must and will exceed your expectations in every way! 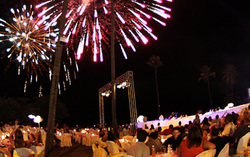 live entertainment, dancing and culminates in an amazing fireworks extravaganza. This truly is an unforgettable experience and just the beginning of your vacation stay with Lifestyle! Celebrated as the best event in the north coast, the welcome party will be the highlight of your vacation. Set under the vast night sky and shores of Cofresi Beach, the party with its dramatic setting, creative festivities and gourmet food provide the backdrop for the greatest night of your life. It is a magical world. Are you ready to embrace it? Our chefs will delight your culinary senses with a host of 5 star creations; which include various delectable choices such as grilled lobster, shrimp, steaks and many other wonderful international foods. Our staff will serve you with a warm smile and gracious regard, while providing you with an international drink selection sure to please and add to the enjoyment of the evening. Our talented performances will astound and inspire with a bevy of high-energy dancers, mind-boggling feats, and a selection of live music that will have you dancing the evening away under the starry expanse of the Caribbean sky. It is an experience that you won’t soon forget. How do you top the perfect evening? For LHVC that’s simple, with an incredible fireworks extravaganza over the ocean that will light up the sky with a profusion of color, drama and well… boom! IF ONE OF THE BEST PARTIES EVER ISN’T ENOUGH FOR YOU, THEN IT ISN’T ENOUGH FOR US!So, mid-week, LHVC hosts a second event to provide another evening of entertainment and play. Hosted at Ocean World, the Bravissimo Show and Party starts when the sun sets on the coast for the evening with a buffet and live music, that is followed with a Vegas-style show with a Latin twist. After the show, the full facilities of this 4-story complex are open for more play. Try your luck at the world-class casino featuring gaming tables, slot machines and more. Lounge on the top floor called the Lighthouse, with private booth areas and DJ jams, while enjoying an unrestricted view of the bay and marina on one side, and the mountain range on the other.